After striking out at the Rainbow Rock Shop and before we toured the Petrified Forest National Park, we stopped at Jim Gray’s Petrified Wood Company. Jim Gray’s, started by Jim and Cathy Gray nearly 50 years ago, is located just south of downtown Holbrook, Arizona on US-180. It’s 1.5 miles from the Wigwam Motel, and about 30 miles from the National Park. Jim Gray’s is still family operated and owned. 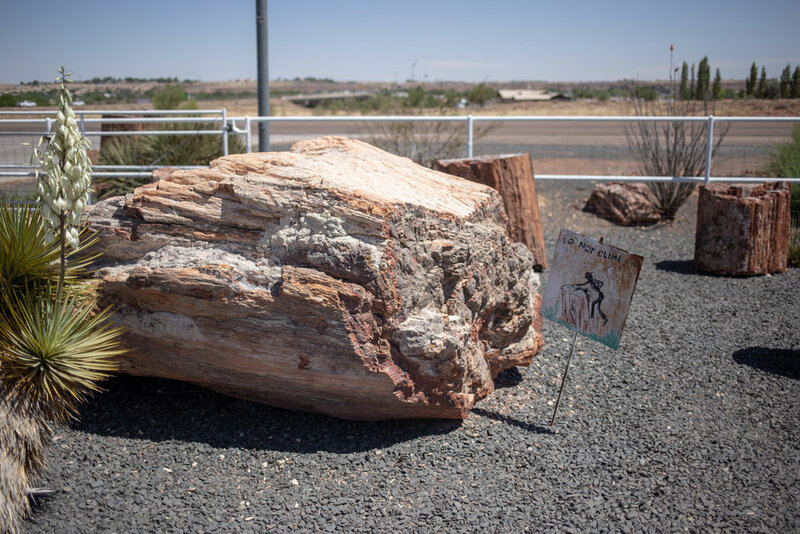 They were originally known as the Holbrook Rock Shop, but have since become “the worldwide premier dealer of Arizona Rainbow Petrified Wood.” Wood from Jim Gray’s has found its way into the Smithsonian, the White House, and museums all over the world. We stopped at several rock shops and trading posts along old Route 66, but Jim Gray’s has the largest collection of petrified wood, by far. Taking specimens out of the National Park is illegal, and the park is monitored on the ground and from the air to prevent theft. Luckily for the Gray’s, they insist that "there's more petrified wood outside the park than in it," and they own the mineral rights to several pieces of land nearby. They do their own digging, cutting and polishing, turning the raw fossilized wood into polished rounds, clocks, bowls, paperweights, tabletops, bookends and other souvenirs. The shop is a bonafide tourist destination on its own, and it beckons visitors with painted billboards advertising its large selection of rocks, gems, minerals, fossils, souvenirs, Indian crafts, and rainbow petrified wood. It also has a squished penny machine, several large dinosaur statues and restrooms. The most famous of its attractions is Wild Bill, a 2.9 million year old alligator. Wild Bill, bought by the Grays in Florida and named for a family friend, is exhibited for free alongside an extensive collection of polished wood and rock specimens from around the world.